If we want to see changes first of all we need to be in peace inside ourselves, and then we need to be patient with the ones that have not yet arrived in that place of peace. Arapahoe-Cheyenne #003300, fourth generation of the Sand Creek Massacre. As a child, Margaret attended the Catholic Mission and Government Boarding Schools. Margaret is a Cheyenne traditional dancer. 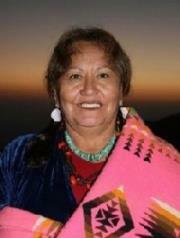 She has served as a dance leader in Oklahoma and in powwows across the U.S. A sculptress for 30 years, she creates clay figurines that have won her many honors, including shows at Eastern New Mexico University, University of Wisconsin, Santa Fe Indian Market and the Gallup Inter-Tribal Ceremonial. This entry was posted in Make No Bones Shows and tagged Connecting with Spirit, Grandmother Margaret Behan, Honoring, Indigenous, KAOS 89.3 FM, Make No Bones About It, Native Woman, Prophecies and 2012, Raven Redbone. Bookmark the permalink.